We also observe this behaviour on our instance since the latest jenkins update we performed. Dieter Blomme added a comment - 2015-12-03 10:27 We also observe this behaviour on our instance since the latest jenkins update we performed. Which progress bar is this? The global executors list, or the builds history widget of a job, or the progress bar shown to the top right when viewing an in progress console output? Daniel Beck added a comment - 2015-12-16 16:10 Which progress bar is this? The global executors list, or the builds history widget of a job, or the progress bar shown to the top right when viewing an in progress console output? Build history widget of a job definitely. Dieter Blomme added a comment - 2015-12-16 16:12 Build history widget of a job definitely. Confirming this still occurs on Jenkins ver. 1.644 as shown in the attached image - I've included the AJAX POST request in the attached screenshot to help explain. Alex Shepherd added a comment - 2016-01-13 15:31 Confirming this still occurs on Jenkins ver. 1.644 as shown in the attached image - I've included the AJAX POST request in the attached screenshot to help explain. No progress bars or build pipeline cards are updated in my Jenkins instance. It's very bothersome! Rares Oltean added a comment - 2016-04-05 15:01 Hi guys! Any update on this? It still reproduces in 1.655 No progress bars or build pipeline cards are updated in my Jenkins instance. It's very bothersome! We are seeing the same issue as well with LTS 1.651.1. Joshua Ayson added a comment - 2016-05-20 19:10 We are seeing the same issue as well with LTS 1.651.1. Is anyone affected who doesn't use custom CSS/JS to style Jenkins? Daniel Beck added a comment - 2016-05-20 21:30 Is anyone affected who doesn't use custom CSS/JS to style Jenkins? Daniel Beck - Yep – no custom CSS/JS here, and we see this issue with v1.651.2. Calla Feucht added a comment - 2016-05-26 16:38 Daniel Beck - Yep – no custom CSS/JS here, and we see this issue with v1.651.2. Anyone remember what the first version of Jenkins was to have this problem? Daniel Beck added a comment - 2016-05-26 17:03 Anyone remember what the first version of Jenkins was to have this problem? Hmm I don't know where/when it started, but I do know that it was not present in v1.596. Calla Feucht added a comment - 2016-05-26 17:05 Hmm I don't know where/when it started, but I do know that it was not present in v1.596. Peter Eisentraut added a comment - 2016-05-27 02:19 No custom CSS/JS here. Daniel Beck - Any further luck with this? Calla Feucht added a comment - 2016-06-01 16:18 Daniel Beck - Any further luck with this? Another behavior I've noticed: when on a job's overview page while a build is in progress, if that build finishes and another starts, both builds will appear to have active progress bars even though only the latter is running. 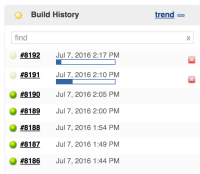 Calla Feucht added a comment - 2016-07-07 18:20 Another behavior I've noticed: when on a job's overview page while a build is in progress, if that build finishes and another starts, both builds will appear to have active progress bars even though only the latter is running. The build start and the progress bar hangs like previous screenshots shows. So seems to be related to parameterized builds. Allan BURDAJEWICZ added a comment - 2016-08-05 03:25 I did troubleshoot this. I can easily reproduce with Jenkins 1.651 and Jenkins 2.7.1 too. Here is the simplest scenario: Create a Freestyle Job Add a Shell task "sleep 10" so that you can notice the behavior of the progress bar Build the job You should see the build job progress bar refreshing and switching to complete Configure the Freestyle Job Check the "This build is parameterized" and add a String Parameter Build the job The build start and the progress bar hangs like previous screenshots shows. So seems to be related to parameterized builds . Allan BURDAJEWICZ Actually, I was able to observe this in 2.14 for those progress bars that have been present when the page was loaded. Those that appeared later were correctly progressed. That also means that clicking (e.g.) "Status" to load the job index page will effectively halt progress of the build just triggered clicking "Build Now". I suspect that the page redirect due to the parameters form resulted in your observation, but it has nothing to do with parameterized builds. Daniel Beck added a comment - 2016-08-06 00:00 Allan BURDAJEWICZ Actually, I was able to observe this in 2.14 for those progress bars that have been present when the page was loaded. Those that appeared later were correctly progressed. That also means that clicking (e.g.) "Status" to load the job index page will effectively halt progress of the build just triggered clicking "Build Now". I suspect that the page redirect due to the parameters form resulted in your observation, but it has nothing to do with parameterized builds. Anyone want to test 1.632 and 1.633 to determine whether this issue was introduced in the latter release, with build history pagination? Daniel Beck added a comment - 2016-08-06 00:00 Anyone want to test 1.632 and 1.633 to determine whether this issue was introduced in the latter release, with build history pagination? The progress bar is broken in every versions after that. Gerard CK You're saying it's broken in 1.625.3 as well? Daniel Beck added a comment - 2016-08-06 16:22 Gerard CK You're saying it's broken in 1.625.3 as well? Gerard CK added a comment - 2016-08-07 08:12 Yes this is correct. Gerard CK Weird. 1.625.3 is only a security update – while we've had some issues recently with security fixes that broke things, I don't see a related change there. Did you make sure that a timing/page load issue with loading the builds widget as I mention in my previous comment cannot be responsible? Daniel Beck added a comment - 2016-08-07 16:08 Gerard CK Weird. 1.625.3 is only a security update – while we've had some issues recently with security fixes that broke things, I don't see a related change there. (For reference: https://github.com/jenkinsci/jenkins/compare/jenkins-1.625.2...jenkins-1.625.3 and https://wiki.jenkins-ci.org/display/SECURITY/Jenkins+Security+Advisory+2015-12-09 ) Did you make sure that a timing/page load issue with loading the builds widget as I mention in my previous comment cannot be responsible? I confirm it's as described by Gerard CK, this issue was introduced between 1.625.2 and 1.625.3. Daniel Beck added a comment - 2016-08-08 13:59 I confirm it's as described by Gerard CK , this issue was introduced between 1.625.2 and 1.625.3. First culprit in old releases was https://github.com/jenkinsci/jenkins/pull/1856 – but as comments indicate, it's no longer a problem in current releases. The difference is, that change completely disabled AJAXing, while the problem here is that requests are sent, but responses are empty. In regular releases, https://github.com/jenkinsci/jenkins/commit/078d3c7c4b5ffc5eae2f8c300a681bc340dfec60 is the first broken commit via git bisect, ignoring the aforementioned issue with AJAX requests not getting sent at all. So in weeklies, 1.633 should be the first broken one. Not sure what's going on with 1.625.3, but 078d3c7c seems to be the real culprit. Daniel Beck added a comment - 2016-08-08 21:13 In regular releases, https://github.com/jenkinsci/jenkins/commit/078d3c7c4b5ffc5eae2f8c300a681bc340dfec60 is the first broken commit via git bisect , ignoring the aforementioned issue with AJAX requests not getting sent at all. So in weeklies, 1.633 should be the first broken one. Not sure what's going on with 1.625.3, but 078d3c7c seems to be the real culprit. Still occurs in 2.17 (after fix for JENKINS-31791). Daniel Beck added a comment - 2016-08-09 15:20 Still occurs in 2.17 (after fix for JENKINS-31791 ). Appears to be caused by the wrong offset sent for nextBuildNumberToFetch – the client says he's just not interested in build that already exist when the initial page was loaded. Noticed another problem in the process though, if no build is running when the page loads, there's never going to be AJAX updates. Not sure whether caused by my WIP or in general, but this'll take some more time. Daniel Beck added a comment - 2016-08-09 16:11 Appears to be caused by the wrong offset sent for nextBuildNumberToFetch – the client says he's just not interested in build that already exist when the initial page was loaded. Noticed another problem in the process though, if no build is running when the page loads, there's never going to be AJAX updates. Not sure whether caused by my WIP or in general, but this'll take some more time. Matthew Reiter Looks a lot like what I did locally. Same issue as mine though AFAICT, if there was no build running when the page loaded, the list is never updated. Can you confirm the same behavior? Daniel Beck added a comment - 2016-09-02 23:32 Matthew Reiter Looks a lot like what I did locally. Same issue as mine though AFAICT, if there was no build running when the page loaded, the list is never updated. Can you confirm the same behavior? Daniel Beck Yes, I am seeing the same behavior. I opened two browser windows pointing at the job page, kicked off the build on one window and saw that the other window didn't see the build until I refreshed the page. Matthew Reiter added a comment - 2016-09-06 14:42 - edited Daniel Beck Yes, I am seeing the same behavior. I opened two browser windows pointing at the job page, kicked off the build on one window and saw that the other window didn't see the build until I refreshed the page.